It has never been more important for our community to come together in an effort to restore Bo Rein Stadium. For the past 80 years, Bo Rein has been home to some of the greatest sporting events in Northeast Ohio. These events include countless athletic events, graduation ceremonies, the Relay for Life, state playoff games, and community events. Originally erected as WPA project in the 1930's, Bo Rein Memorial Stadium (formerly Riverside Stadium) opened as the home athletic facility for the Niles City Schools. In the late 1960's, nearly 40 years after its erection, it became apparent that the original stadium was not meeting the needs of our community. Together, both the schools and businesses united to raise the funds to turn Riverside Stadium into one of Ohio's finest athletic facilities. Now, 40 years beyond expansion, the time to return the stadium to "Ohio's Best" is upon us. Understandably, time, exposure to the elements, and advances in technology all make now the right time for Renovating Excellence In Niles. We offer thee our love. thy flag of Red and Blue! 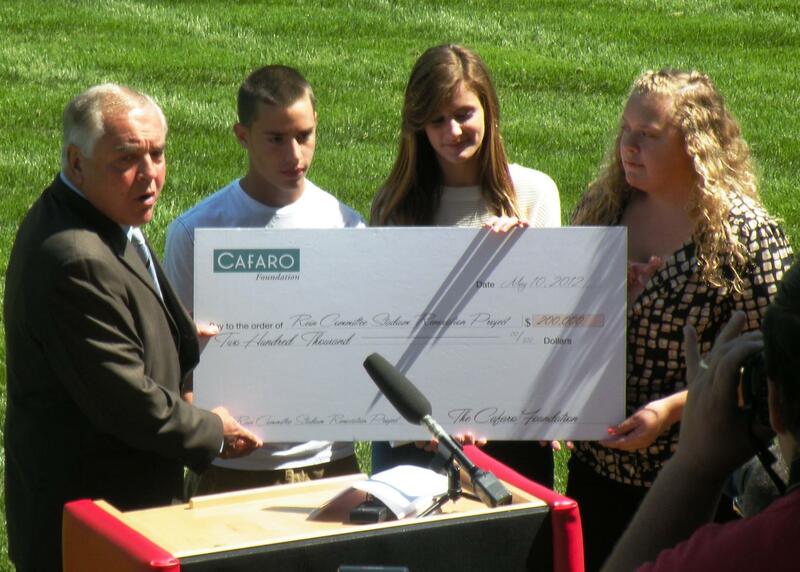 Cafaro Foundation donates $200,000.00 to REIN Project!